Published as: “Ежедневный каулический ритуал (nityāpūja) в Тантралоке”, Адеш №9 (2013) 14-15. 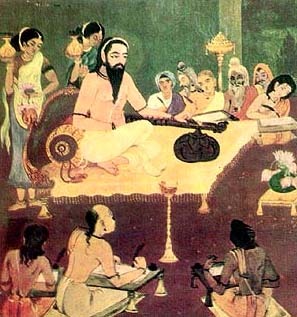 “The Kaula daily ritual (nityapūjā) in the Tantrāloka,” in Adesh No. 9, 2013, pp. 14-15.
śloka 19 perform the cleansing which consists of ‘fire’ and ‘growth’, ‘burning’ and ‘cooling’ respectively, in due order. Or else [he may do this], with the mantra Mātṛsadbhāva. śloka 20 … Next, by means of śakti alone he should bestow immortality on the articles to be purified. śloka 21 [Mālinī] enclosed by Parā; or [Mālinī] enclosed even by Mātṛsadbhāva]; or Mālinī by itself: these are the [distributions of Mālinī] in all ritual actions. śloka 22 Let him fill the vessel with ingredients, which are the fruit and the causes of joy. At that point, through an identity with the mantra that has been mentioned, he should bring himself to the state of Bhairava. śloka 23 Consequently, he should satiate the self with its multitude [of goddesses] in the circle and sub-circle, externally by sprinkling drops upwards and downwards, and internally by drinking. śloka 18a The place of ritual is filled with items pleasing to the senses, such as flowers and incense, for they will stimulate the practitioner, as will even more so the substances in the cup to be mentioned in śloka 22a. In the symbolism of the ritual, the east represents life and its multiple enjoyments for that is where the sun rises to make its varied course across the sky. The north, where the sun never goes, represents that which transcends life, and therefore symbolises the realm of liberation. By facing northeast, the practitioner shows that he is ‘liberated-while-living’ (jīvanmukta). śloka 18b-19 The human body represents the universe. The practitioner begins the ritual by regenerating himself / herself and the universe by means of the great mantras of the Kula tradition, which are the phonic form of the goddess and are imbued with all her powers. These mantras are Parā, Mālinī and Mātṛsadbhāva. The phonic form of Parā is SAUḤ. The phonic form of Mālinī consists of the fifty phonemes of the Sanskrit alphabet in jumbled order such that the vowels, which represent Śiva or seed, and the consonants, which represent śakti or the womb, are united. Its abbreviated form NA-PHA consists of the first and last phonemes of that listing. Because of its mixture of ‘seed’ and ‘womb’ Mālinī is essentially sexual in nature and has a more emanative character. By contrast, the phonic form of Mātṛsadbhāva, KHPHREṂ, has a more reabsorptive quality. By the process of ‘burning’ from the tip of the big toe to the tuft of his / her hair on his head, the practitioner experiences reabsorption (saṃhāra) into pure consciousness, for she/he is being consumed into its fire. That is, by sequentially placing (nyāsa) the mantra on the parts of his body he is progressively identified with the Self. He is then refashioned by the opposite process of ‘cooling’ or emanation (sṛṣṭi), likewise by a process of installing the mantra. The practitioner, consciousness and the universe are thus wholly regenerated and identified. śloka 20b The practitioner also consecrates the articles, such as flowers, the ingredients of the vessel. Otherwise they would be inappropriate for the ritual. He does this simply, without any action and just by means of the mantra called rudraśakti, which is Mālinī enclosed by Parā; or Mālinī enclosed by Mātṛsadbhāva. śloka 21 “Mālinī enclosed by Parā” is SAUḤ-NA-PHA-SAUḤ. “Mālinī enclosed by Mātṛsadbhāva” is KHPHREṂ–NA-PHA-KHPHREṂ. “Mālinī by itself” is NA-PHA. The central mantra NA-PHA is the focus of this ritual, being enclosed (saṃpuṭita) by the other mantras. śloka 22a He prepares the vessel with its 3 M’s (makāras): namely māṃsa, meat; madya, wine; and maithuna, which is sexual union or, by extension, the sexual fluids which result from it. In other words, the 3 M’s are not a means to achieving a consciousness, which does not yet exist but a way of expressing what is already present. The daily ritual is performed from a state of enlightened consciousness. The contrast with the agreeable substances such as perfume and incense mentioned in śloka 18 is intentional. The daily ritual involves both beauty and horror, just as it involves what is forbidden and what is permitted. The non-dualist mind rejects such divisive concepts (vikalpa) and shows it by intentionally using irreconcilable opposites. The practitioner has no regard for the categories of pure and impure, pleasant or unpleasant. He transcends such divisions for he is identified with absolute consciousness itself. Of these ingredients the last, sexual fluid, is by far the most important. The cup (pātra) contains, therefore, the meat and wine, which lead to congress and the sexual fluid, which results from congress. The cup, therefore, represents the whole domain of bliss: all that leads to it and all that results from it. śloka 22b By means of the mantra, the practitioner has regenerated himself as Bhairava, the fearsome form of Śiva, and now proceeds to use the fearsome substances of the cup. śloka 23 He now performs the act of sprinkling, which has a range of meanings. It refers in the first instance to the emanation of the universe, which proceeds from the bliss of Bhairava in union with his śakti. Secondly it refers to the reabsorption of the universe for the various faculties, or rather the goddesses of the faculties, seek their objects so as to be satisfied. By providing them with substances both fearsome and blissful, they are content and, since the lower circles are organically linked to higher circles and ultimately to consciousness, the Self is satiated. The practitioner, Bhairava, thus rests in peace. That quotation comes from a later ritual in chapter 29, but it is equally applicable to the daily ritual which is the essence all the Kula rituals. Having acquired an expansive and blissful state of mind, the Kaula practitioner can then be involved in the busyness of everyday life. The Kula daily ritual is tied to a cultural system that existed in Kashmir one thousand years ago. The ritual can scarcely be conducted in this form in our own day, at least in the West. In our modern context, the consumption of wine and meat, and maithuna with women of the lowest caste do not carry the powerful sanctions as in the time of Abhinavagupta. The antinomian element – essential to the ritual – is hardly available. The question then arises: how can the principles that underlie the Kula daily ritual be reinterpreted for our time? Need they be reinterpreted for modern use? This entry was posted in Hinduism, Kashmir Shaivism. Bookmark the permalink.